Two interrelated aspects of water law are important for protecting the public's interest in water. First, the general public has rights to use water in place (without diversion). Second, governments can control the way water is used in order to benefit the public. Swimming, fishing, canoeing, and commercial navigation can all be public rights . These public rights let members of the general public use water for the specified purpose. The government also exercises its power over water through the use of regulations or public works projects that can significantly affect water use. Public works projects related to water have a long history in the United States, having been used for flood control, municipal water supplies, sanitation, irrigation, and navigation improvements. Other government controls are more regulatory in nature and include, for example, environmental protection, water-quality improvement, and hydropower regulation. These assertions of power or control often conflict with private rights. The right of ships to use navigable waters for commerce has a long history and is recognized in the commerce clause of the U.S. Constitution. This creates the federal "navigable servitude" as a property right held by the government for the benefit of the general public. The right is designed to keep waterways open for commercial navigation, and it is dominant over other rights. Under another navigation concept, states received ownership of the beds of navigable waters at statehood. State bed ownership provides another basis for public rights under state law. Commercial navigation (represented by the barge, foreground) and other river-based transportation (represented by the paddlewheelers, background) are examples of public water rights. 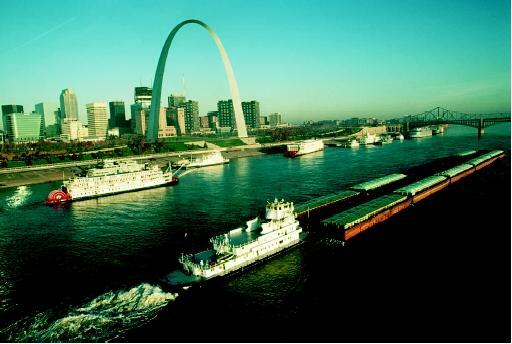 Navigation—in this case along the Mississippi River near the Gateway Arch in St. Louis, Missouri—is a particularly dominant right held by government for the public benefit. expanded public rights to recreation by claiming ownership of the water itself. Federal and state definitions of navigable waters vary considerably. The public trust doctrine often is associated with state bed ownership, but it can apply to any natural resource owned by a state. Many western states claim ownership of all waters within the state, making the doctrine nominally applicable to all waters. Under this doctrine the state holds these water in a fiduciary capacity for the benefit of the general public. This means that the state has an obligation to manage the resource for the public's benefit. States generally have significant leeway in determining what benefits the public, and states interpret the doctrine in different ways. State attempts to eliminate public trust rights through sale or other means may be invalid. These rights belong to the public, and private rights may be subservient to them. If the exercise of public trust rights interferes with private rights, the private right-holder may not be entitled to compensation even if the public right is not asserted until long after the private right is established. This occurred in California when the private water rights of Los Angeles were restricted to provide water for Mono Lake. * This California example is unusual and most western states have not interpreted the doctrine in a way that interferes with existing private water rights. The public trust doctrine protects the public's right to use water in place. Federal actions reserving public lands implicitly create a water right. The right allows for enough water to accomplish the purposes of the reservation. For example, when the national forests were reserved, a reserved water right was established for watershed protection and timber harvest. National parks and monuments, national wildlife refuges, wild and scenic rivers, and national recreation areas all have reserved water rights. Lands managed by the Bureau of Land Management generally are not reserved lands. Reserved water rights were created on the date the reservation was made. Private rights established prior to the reservation have a priority over it. Rights established subsequently are subservient to the federal right. The federal right cannot be abandoned or lost through nonuse. If an unused federal right is asserted it can take water from private right-holders whose rights were established after the reservation was made. A variant of federal reserved rights is associated with Indian reservations. When Indian reservations were created, a reserved water right was also created. The right grants enough water to irrigate all the irrigable land on the reservation. Because many federal reserved rights were established prior to private rights, the potential for conflict is high. Western states have been resistant to the concept of reserved rights because the amount of water associated with them is uncertain, and because they have the potential to destabilize existing uses. In western states, public interest statutes can require a consideration of the public interest before granting a new right or approving a change in an existing right. Historically, public interest criteria were satisfied if an individual would benefit economically from the use of the water. Today, public interest criteria are expanding to include environmental and other public concerns. Another way the public interest is served is through state statutes creating minimum streamflows or authorizing instream flows . Different levels of government have benefited the public through regulation and public works projects. In the early history of the United States, local governments developed water-supply systems, sewage disposal systems, and flood-control levees. States were involved in developing canals and establishing systems for allocating water. Through the 1800s federal power over water was limited by narrowly interpreting the commerce clause of the U.S. Constitution to cover navigational issues only. As a result, in the 1800s federal actions were generally limited to improving rivers and harbors. By the early 1900s, federal power was accepted for the purpose of constructing public works projects related to flood control and irrigation. In 1920, an administrative agency was established to license nonfederal hydropower projects. Today, federal regulatory power over water is broadly authorized by an expansive interpretation of the Constitution's commerce clause and includes power over water quality and the environment. The mix of public and private rights with the overlay of government regulation creates the potential for significant conflicts. When the conflicts are between federal and state laws, the U.S. Constitution gives federal laws supremacy over conflicting state laws. Federal supremacy means private water rights created under state laws are subject to federal regulation. However, the federal regulation cannot be so onerous as to constitute a taking of private property under the U.S. Constitution. SEE ALSO California, Water Management in ; Instream Water Issues ; Law, Water ; Prior Appropriation ; Rights, Riparian ; Transportation. MacDonnell, Lawrence A. "Federal Interests in Western Water Resources: Conflict and Accommodation." Natural Resources Journal 29 (1989):389–411. MacGrady, G. "The Navigable Concept in the Civil and Common Law: Historic Development, Current Importance, and Some Doctrines that Don't Hold Water." Florida State University Law Review 3 (1975):513–615. Sax, Joseph. "The Public Trust Doctrine in Natural Resources Law: Effective Judicial Intervention." Michigan Law Review 68 (1970):471–570. Tarlock, Dan A. "The Endangered Species Act and Western Water Law." Land and Water Law Review 20 (1985):1–30. Trelease, Frank J. Federal–State Relations in Water Law. Washington D.C.: NationalWater Commission Legal Study, No. 5. 1971. Wilkenson, Charles F. "Western Water Law in Transition." University of Colorado Law Review 56 (1985):317. * See "California, Water Management in" for a photograph of tufa towers at Mono Lake.